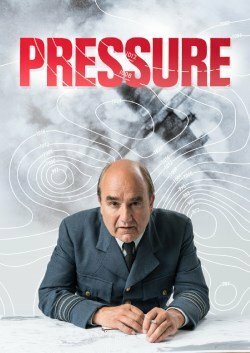 Based on the remarkable true story of two warring Allied meteorologists tasked with predicting the weather conditions for the D-Day landings, David Haig’s critically acclaimed play Pressure will transfer to the West End’s Ambassador’s Theatre for a limited season from 6th June to 1st September 2018. The transfer follows a celebrated run at Chichester Festival Theatre (5 stars from the; Daily Telegraph, Observer & Evening Standard), a national tour (in association with Cambridge Arts Theatre and Touring Consortium Company) and a sold-out run at the Park Theatre. 72 hours prior to the D Day landings, Scottish meteorologist, Group Captain James Stagg, advises General Eisenhower on the weather conditions likely to prevail when 350,000 troops are to be sent across the Channel in Operation Overlord. With Stagg predicting severe storms and Irving P. Krick – Hollywood’s meteorological movie consultant – predicting beautiful weather, the future of Britain, Europe and the United States rests on one single forecast. Pressure was originally commissioned by the Royal Lyceum Theatre Edinburgh as a co-production with Chichester Festival Theatre. The production premiered at the Royal Lyceum Theatre Edinburgh in 2014, followed by a run at Chichester Festival Theatre. David Haig is a five-time nominee and Olivier Award-winning actor best known for his roles in the film Four Weddings and a Funeral, TV series The Thin Blue Line and stage production of The Madness of King George III (Tour and West End). He is also an award-winning playwright. He wrote and starred alongside Daniel Radcliffe in My Boy Jack – which was made into a TV drama for ITV in 2007. Malcolm Sinclair will reprise his role as General Eisenhower. Sinclair has performed extensively in leading roles with theatre companies such as the National Theatre and the RSC. He has performed widely, both in Britain and internationally. In 2001 he won the Clarence Derwent Award for his role as Gavin Ryng-Maine in the National Theatre’s production of House/Garden and was also nominated for an Olivier Award for best-supporting actor for his performance as Major Miles Flack in Privates on Parade. Laura Rogers will reprise the role of Kay Summersby. Her theatre credits include: An Ideal Husband, Masterpieces (Royal Court), Blue Remembered Hills (Chichester Festival Theatre), The Comedy of Errors (USA Tour and Shakespeare’s Globe), The 39 Steps (West End), Hay Fever (Chichester Festival Theatre), Macbeth, A Midsummer Night’s Dream, The Taming of the Shrew and Richard III (Shakespeare’s Globe) and Bad Girls – The Musical (Garrick Theatre and West Yorkshire Playhouse). Her television credits include: EastEnders, New Tricks, Dates, Twelfth Night, Doctor Who and Bad Girls. Pressure at the Ambassadors Theatre is produced by Jonathan Church Productions, Jenny King & Oliver Mackwood Ltd.